How to use the TOGAF ADM Guide-through? Architecture Roadmap is one of the TOGAF deliverables you can create with the TOGAF software. The Architecture Roadmap lists individual increments of change and lays them out on a timeline to show progression from the Baseline Architecture to the Target Architecture. 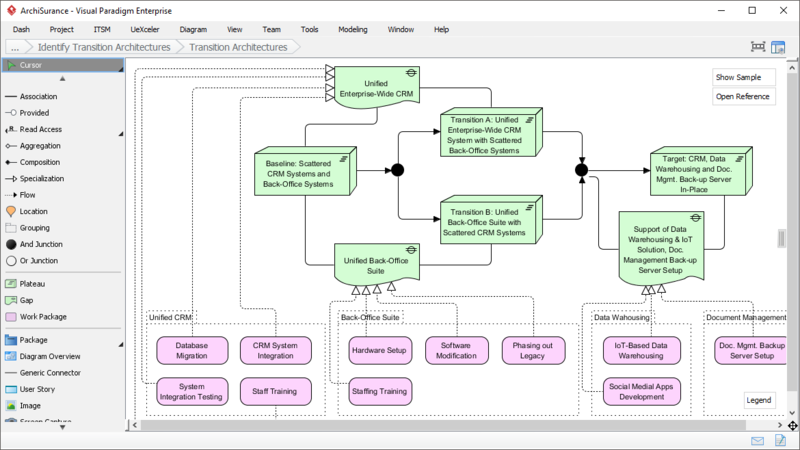 The Architecture Roadmap forms a key component of Transition Architectures and is incrementally developed throughout Phases B, C, D, E, and F within the ADM. The purpose of this document is to define one or more architecture roadmaps for the relevant domain/sub-domain. Note: The roadmap may also need to be synchronized with wider program/project plans or more strategic roadmaps. Note 2: The role of the current planning functions will determine the level of detail and breadth of information on the architecture roadmaps. Note 3: Care should be taken to minimize the duplication of effort and content in order to produce plans/roadmaps. Study the requirements and gaps identified in phase B, C and D, and then deduce implementation factors by completing the Implementation Factor Assessment. In phase B, C and D you have developed the target Business, Data, Application and Technology Architectures. In this activity you have to find out the actions or constraints that have to be taken into consideration when formulating the implementation plans of the target architectures. Architecture Domain: Architecture domain like Business, Application or Information. 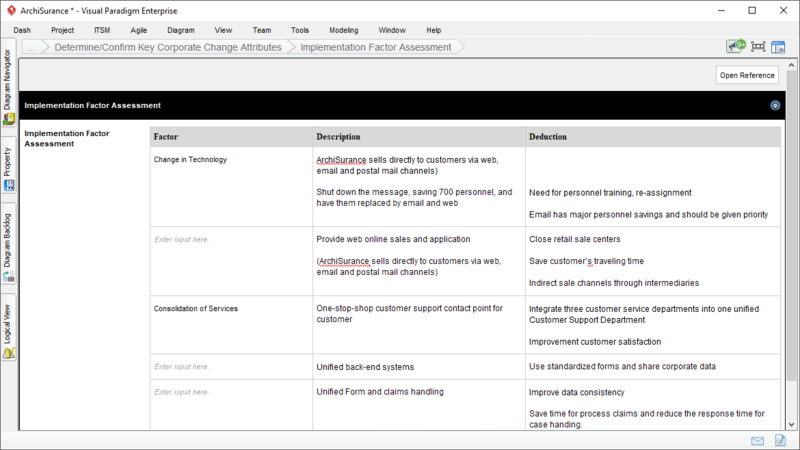 Gap: Description of differences between the baseline and target architecture, for instance, an integration of CRM systems. Potential Solutions: The possible measures to take in order to address the gap. Dependencies: Determine the dependencies between domains by considering the relationships of elements in the different architectural domains. 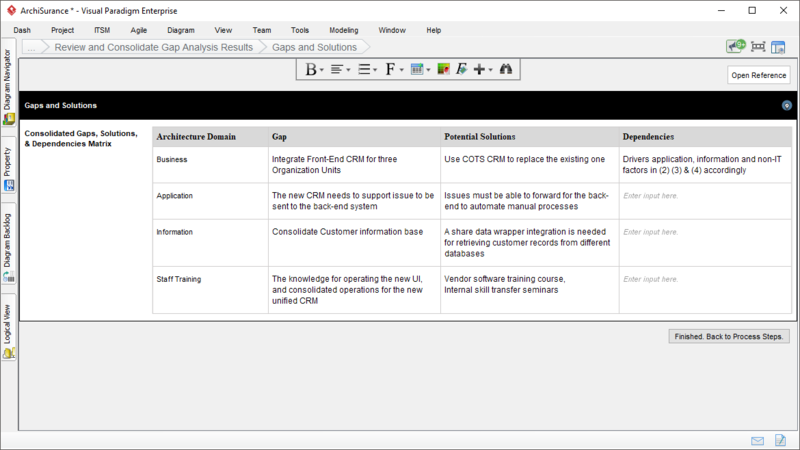 Identify and organize major project activities as work packages, with the use of Work Breakdown Structure (WBS). The Work Breakdown Structure (WBS) is a hierarchical description of the work that must be done to complete the deliverables. Each descending level in the WBS represents an increasingly detailed description of the project deliverables. The Work Breakdown Structure Dictionary (WBS Dictionary) lists all the WBS elements involved in a project. Each WBS element has a definition which can be thought of as a mini scope statement. In this step, you are required to enter the definition of each of the WBS element created in the Work Breakdown Structure. Deliverable(s): The result of completing the work package. It can be a part of a project deliverable (e.g. a feature), or in form like a document or report. Cost: The expenditure of this work package. Resource Needs: Resources need to complete this work package. Milestones: Major events in the work package, such as the planned start and completion of work, date of review or any important meetings. 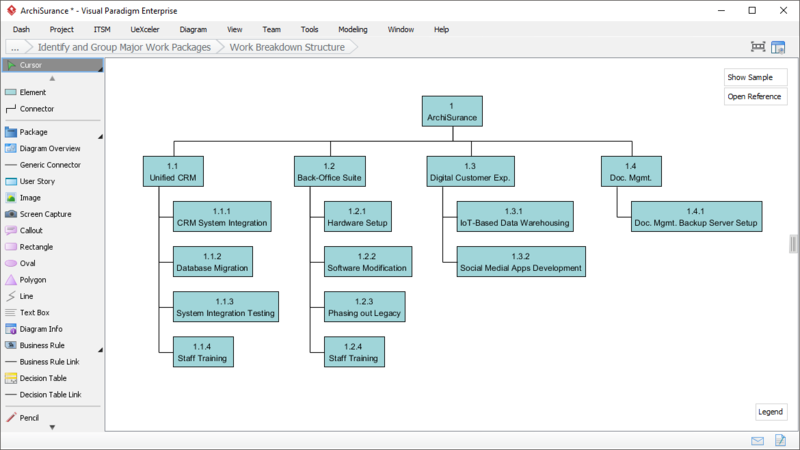 Draw an ArchiMate diagram to outline the roadmap. 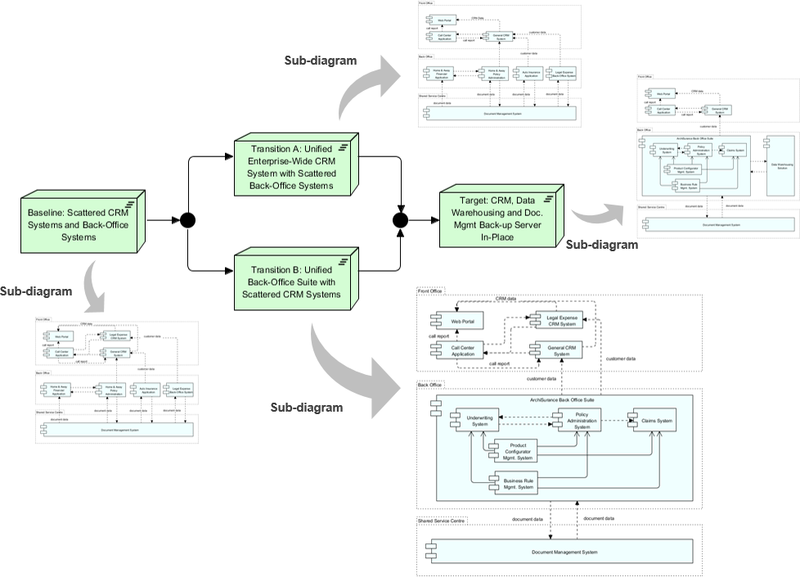 Show the various architecture plateaus (Baseline, Target and any Transition Architectures) and their arrangement. Bridge the plateaus with gaps (shapes). The gaps refer to the gaps identified in gap analysis. Therefore, name them based on the result of gap analysis. A set of work packages have been visualized for you. Associate them with the gaps to represent the architecture work required to perform and complete for each of the architecture states. You have created a roadmap that shows the migration from Baseline to Target Architecture. In this step you are required to model the Architecture outcome for each of the Baseline, Target and Transition Architectures. 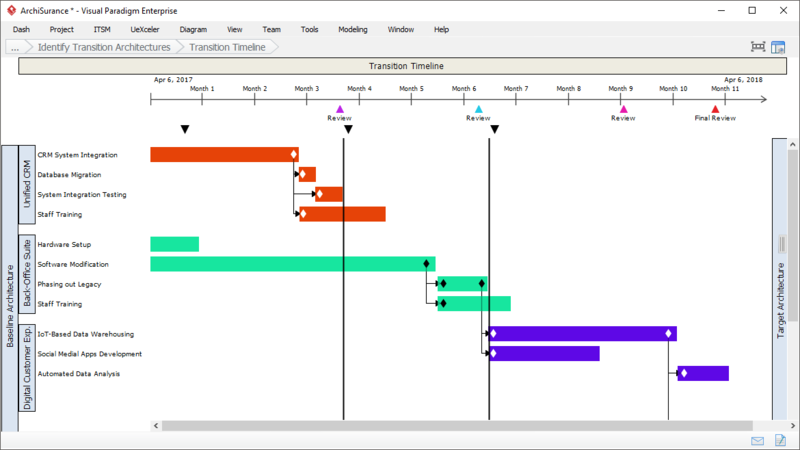 Configure the timeline in the roadmap by providing a start date and specifying the project. Configuration can be made by right clicking on the timeline and selecting Configure… from the popup menu. Drag on the edge of the work package bars to adjust their start and end dates. Position the vertical Transition Architecture bar(s) based on their planned delivery dates. [Optional] Indicate any major milestones below the timeline. To do this, right click on the timeline and select Add Check Point Here from the popup menu, and then give it a meaningful caption (e.g. Interim Review). [Optional] Indicate the date when investment/funding will be made. To do this, right click below the check points region and select Add Investment Point Here from the popup menu, and then give it a meaningful caption (e.g. Initial Funding).